Here are my picks for best games I played this year! 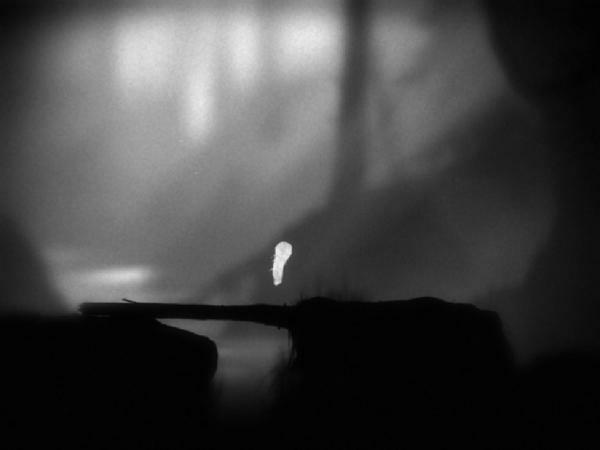 LIMBO is a side-scrolling puzzle game that I play on my iPad mini. My boss suggested it to me after I mentioned that I was looking for a scary game with a good story. Your character begins by waking up in a dark forest (very Dante’s Inferno, but no Virgil to be found) and starts to explore. At first, I was frustrated at the lack of direction that the game was willing to give me. I couldn’t figure out how to move a box, but, as you would in real life, you learn as you explore. What’s interesting to me is that the story of what’s going on is created in your head, as there’s no dialogue or text that I’ve encountered so far. The world of LIMBO is in greyscale and is quite dark. The edges of the game are feathered, which adds to the eerie atmosphere. This results in difficulty navigating, which almost always leads to death by hidden bear traps and deadly LIMBO-dwelling creatures. The tiny ambient sounds in the game, though creepy, were relaxing at first. I found the world weirdly pretty. My character was moving through the woods and a group of tiny butterflies caught my eye. As I moved forward, distracted, I was killed (gruesomely!) by a bear trap. I haven’t finished the game yet, but the most recent scream-inducing part was when one of the giant spiders speared me with its leg. The Prom King is an episodic Twine game where each story ties into the next. It really reminded me of a NSFW version of the choose-your-own adventure books that pulled me in as a kid. I’m a sucker for anything that’s a mystery. This really functioned as such as I put together clues. Links lead you to character descriptions, explanations of clothing, items, and tidbits of backstory. Images are used well to supplement the story, and one even freaked me out. It really inspired me to try out making a Twine game myself. I wasn’t even born when this game came out. Goodness. 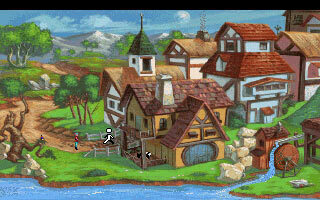 I remember playing King’s Quest V as a little kid with my sister and my dad. We had a little hint book that came with the game. You could only look at the hints if you used a piece of red cellophane to decode them. Recently, my sister and I streamed this game online, along with Soha and Arden of the StreamFriends, and I got to relive all of the frustration. We still even have the book and our original bit of cellophane. Here’s all you need to know about the game: there’s an annoying owl, Cedric. There’s a stupid puzzle with some frozen peas. You have to throw pie at a yeti. Nothing makes sense, nothing is very evident, and you die a lot. Oh, and there’s a maze. Just quit before the maze. I used to play Animal Crossing, the original, for the GameCube all the time. This was a welcome new version. There’s quite a bit more you can do in New Leaf compared to the original Animal Crossing. 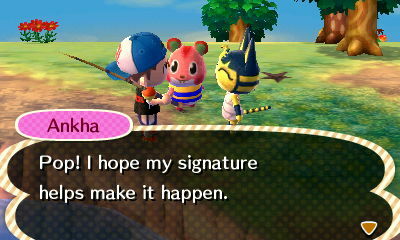 You can take trips to an island, develop your town as Mayor, and you have a lot more opportunity to customize your town. Don’t worry though – there’s still weeds to pull and Tom Nook to hassle you about your loan. Currently, I’m dressed as an adorable strawberry and a tiny pink hamster is one of my best friends. You can see her in the background of the screenshot here. I watched a Let’s Play of this with my boyfriend and decided that I had to have it. We play on the PS3. Ever play Kaizo Mario World? It reminds me of a tamer version of that. It’s an increasingly-dangerous side scroller that can be played with up to four people. You can design your hero any way you want. Bunny ears? Sure. Bunny ears and a beard? Even better. Don’t forget a wizard hat! It’s pretty cool actually – the game uses algorithms to create levels that adapt to all sorts of variables. In some levels, you’re super springy; in some, you are Bob-In-A Box; and some levels let you use a jetpack. Dangers you may face include: lasers, spiky rocks with faces, and falling blocks. 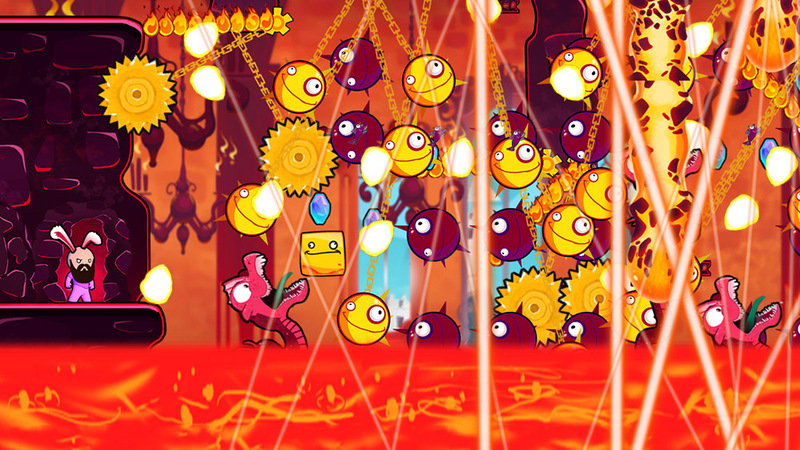 Some levels can be frustrating, but never impossible. Choose who you play with carefully. This game will end friendships.